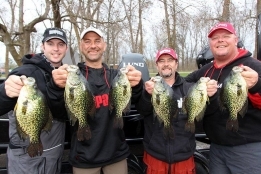 Stoco Lake Black Crappie Tournament Rescheduled for May 10, 2014. Time to get your boat on the water and your fishing poles geared up for a great spring fishing season! On May 10, 2014 join us for a fun filled day! Stoco Lake is renowned for phenomenal Black Crappie fishing. This one day live release tournament is a great way to get outdoors and enjoy spring fishing in the Municipality of Tweed's backyard! It's also a great way to win some great cash prizes! To register for the tournament and view the rules and regulations click here.